Soak the whole grain barley overnight. Rinse the barley under running water, collect it in a pot and cover with water: use a quantity of water equal to six times its volume. Cook the barley on low flame for about an hour and a half, until it is soft, but still al dente. Drain and cool under running water. Dice the eggplant, the zucchini and the cherry tomatoes and add them into a pan with extra virgin olive oil, a crushed clove of garlic and a pinch of salt. Cook the vegetables over medium heat, stirring often, until they soft, golden and well cooked. 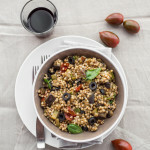 Now add the barley, the sliced pitted olives and a sprinkle of dried oregano, toss and season with salt. Garnish with fresh basil and serve warm.